That’s just fun to say out loud, no matter what you’re doing. But it’s even more fun if you’re... deploying flight mode. 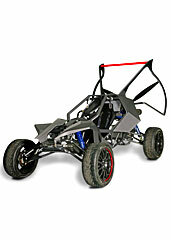 You can do that in the SkyRunner, a souped-up ATV that’s also a fan-propelled paraglider, because why wouldn’t it be, available for preorder now and shipping in early 2014. It’s fast. Zero to 62 in 4.3 seconds fast. And it’s got its own paraglider wing to take you 15,000 feet above the ground. That’s where the whole flight mode part comes in. But first, you’ll take a seat and start the engine. Then, you’ll start hurtling toward its 115 mph maximum land speed. And when you’re ready... push the button. The fan propeller behind you kicks in. The paraglider wing goes up. And suddenly, you’re in the air with the option of staying there for up to 200 miles’ worth of flight. In other words, it’s fuel efficient. And if you’re anxious about the whole defying-gravity thing, there’s a ballistic reserve chute you can deploy in the improbable event of engine or parasail failure.